Braun’s range of epilators, including this one, feature thoughtful and useful pieces of technology such as the pivoting head, SmartLight and SoftTips feature that lifts hair before removing it. With these technologies and the various attachments, they are epilators to aspire to. If you’re a beginner who doesn’t want to shell out £100, then this Epil 7 with just the efficiency cap isn’t a bad choice. It may still be quite expensive, but cheaper ones could put you off for life. For the money, I think this one is worth it for two reasons. Firstly, it’s quickly rechargeable and you can use it more comfortably in the shower, and secondly, it’s highly effective with minimal discomfort. It feels great to hold and you won’t find it frustrating – so if you’re looking for quality as a beginner, this is where you’ll find it. The major German consumer products company Braun has been producing high quality goods for almost a hundred years and have long since cemented their reputation. Their ranges of epilators are packed full of technology and come with a large variety of options. Although some of the most expensive epilators on the market, Braun’s talent for inventing and creating first class technology makes them an obvious choice for many. 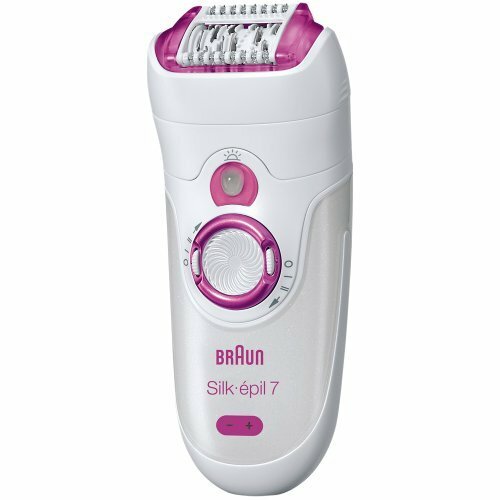 For those who can’t quite stomach the price tag of the more comprehensive Braun epilators, or don’t need quite so many attachments, this Epil 7 with just one attachment could be the compromise you’re looking for. 100% waterproof, you can use this epilator in the shower, which is ideal for those who find epilating painful or just like to get everything done at once. The efficiency cap works well at covering more skin each time, making it much faster, but if you have sensitive skin it may be too much for you. Braun seems to do quite well with getting short hairs with all its epilators and this one is no different. It removes the majority first time round and you won’t need to double back much to get total smoothness. As with other models, this has a pivoting head that can manoeuvre around contours with ease, making the process pretty straightforward. The Olay wipes included are quite soothing after epilating but not particularly necessary if you’re epilating in the shower. Nonetheless, for the price it’s always nice to have extras. This Epil 7 has Braun’s fantastic recharge time of 1 hour and then 40 minutes of use before going flat which makes it just that bit more convenient than other brands of cordless epilators. The design is white and pink but not overly feminine and is fairly unassuming overall. It’s ideal for the beginner as it can be used wet or dry, doesn’t come with a load of attachments you’re not sure you need and just does a good job at what it’s supposed to. 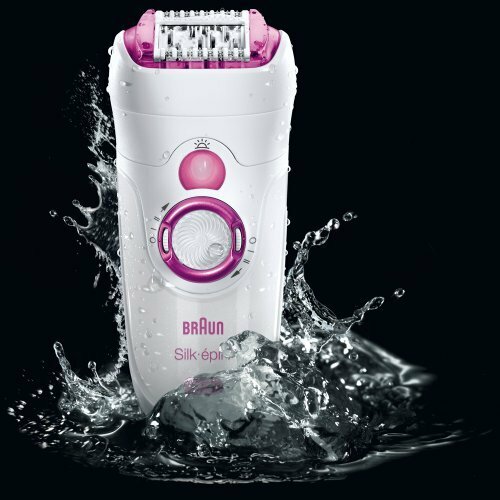 It has the massage feature built into it which makes epilating more comfortable and also features the Braun SmartLight, illuminating hair for easy removal. Lastly, with two speeds, it’s a good tool for the beginner to adjust to the feeling of epilating.